Nadine Aisha is a writer, poet and creative practitioner based in Edinburgh. She performed her solo set Crossing Out the Lines at the Edinburgh Festival Fringe 2014, and her debut poetry pamphlet Still was published by Appletree Writers Press (2016). 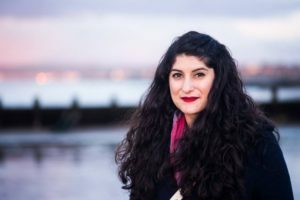 Her work explores women’s stories and women’s survival, examining violence against women, racism and Islamophobia alongside the power of women’s voices and truths, and has drawn praise from and YWCA Scotland. She is active in the movement to end gender-based violence, and works professionally with young people to educate and empower. To find out more visit her website. His sister hushes him away, apologetic. Tells me he didn’t mean it. I am panic: eyes to the child, to the pavement, to the wall, did anyone else hear? To the pavement, to the wall, did anyone else hear him? To the child, to the floor. Returning home, conscious of my face in that child’s mind and the newspapers he has seen and the television he has watched and the words he has heard, I have a memory, briefly, of a university friend in consoling tones telling me I could ‘pass for white’. No matter how gentle, no matter how serene, no matter how many good works I do or taxes I pay or lives I save I will always be, always be, to them a dangerous woman. And what are they to me?